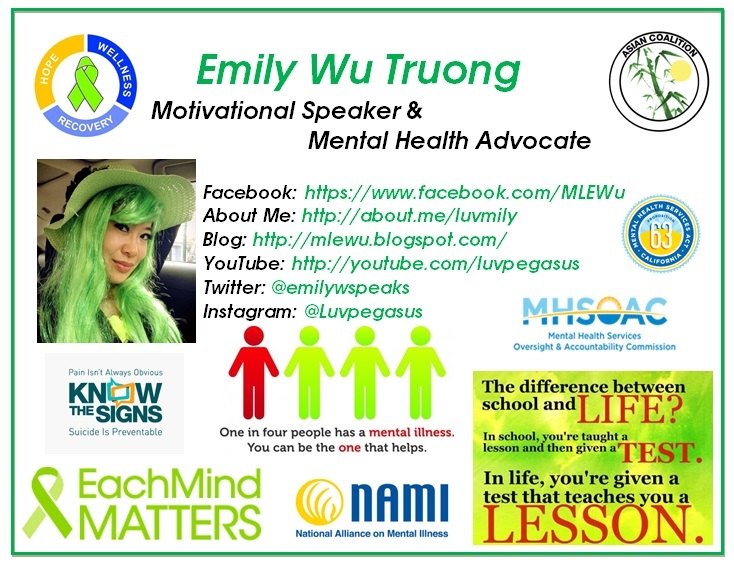 Emily is an emerging leader for mental health awareness, known as the “Lady in Green.” She is a Motivational Speaker & Mental Health Advocate, holding a Bachelor’s Degree in Psychology & Social Behavior from UC Irvine. Emily has become a role model, demonstrating self-initiative and an indomitable will, delivering her message that with help, there is hope. KRL: What led you to become a motivational speaker? Emily: There are so many factors that played a role in my becoming a motivational speaker. However, I would say that my first role model, who inspired me to become who I am now, is Martin Luther King Jr. He’s been my role model since I was in junior high. His ability to speak with such charisma to encourage his fellow Black brothers and sisters to not feel less worthy than the White man inspired me. The way he spoke with conviction captivated his audience, and he truly made a difference in society today having been a leader of the 1960s Civil Rights Movement. He was the first leader who made me want to become someone who could make a big difference in the lives of many. KRL: What do you think are the most effective ways to change the dialogue surrounding mental health? 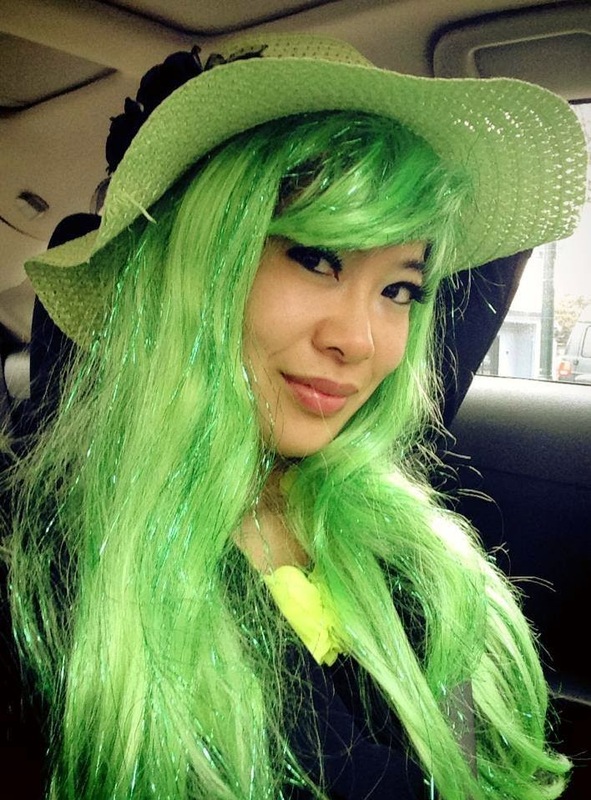 Emily: (1) Wear the lime green ribbon, regardless of whether it is May as Mental Health Awareness Month. Wear that ribbon all year round. The ribbon is a great conversation starter because not many people know what it stands for. So when people ask, it is the perfect opportunity to educate someone who has a misconception about what mental health is all about. (2) Host mental health awareness events (webinars, conferences, seminars, workshops, and community forums) to educate the community. 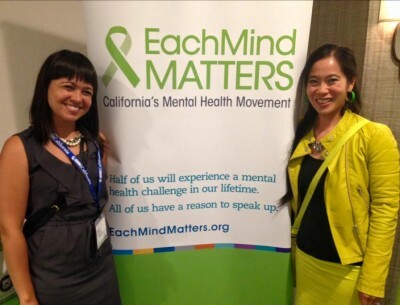 The EachMindMatters.org website provides many resources on their website to help individuals host their own events for this great cause. KRL: How do you feel the current climate is? Do you see an impact from celebrities “coming out” and claiming their mental health? Emily: Yes, I do feel that the awareness for mental health is growing in our communities, and the entertainment industry does have quite an effect on our society. I think that Jennifer Lawrence speaking openly about mental health and mental illness after being featured in the movie Silver Linings Playbook made a difference. I also think that Robin Williams’ tragic suicide provoked many to talk openly about suicide and mental health challenges. That is how I see the good in the bad. Robin Williams, who inspired so many, did not die in vain. KRL: How do you incorporate music into your activism? What gave you the idea to do this? Emily: When I can connect with a song that speaks to my heart, my body feels compelled to move, or I will start singing when I feel I can resonate with the lyrics. Songs like “Brave” by Sara Bareiles and “Roar” by Katy Perry have inspired me to just be myself and speak out when necessary. You can find my video where my friend helped me record my fun experience just dancing in San Francisco’s Union Square here: www.facebook.com/MLEWu/videos or on YouTube: www.youtube.com/luvpegasus. This place called I.M. Jam in Altadena gave me the idea to apply music therapy and dance therapy as part of my recovery. The whole point of dancing there is to feel free to be yourself…to dance as if no one is watching. KRL: What is your favorite question and/or response you have ever gotten from an audience member? Emily: I don’t have any favorites, but I found it interesting when a UCLA student asked me, “What was your form of addiction when you were coping with your life challenges? Most people turn to drugs and alcohol. So what did you do?” My response to his question was “relationships,” because I used to constantly rely on external validation from dating and relationships to feel like a person of worth. However, now that I know my own worth, I validate myself. KRL: What can each of us do in our daily lives to effect change in our community? KRL: What’s the best part of the next thing you’re doing? Emily: Best part? If you’re asking me about my dreams, I do plan on writing a book to write down the content of what I normally share in my speaking engagements. However, in the meantime, I think my ability to embrace change, and my determination to keep on being a mover and shaker no matter what challenges I face every day is my strength. I can’t tell the future nor do I know what life has in store for me, but I do know it will be wonderful, and that I have a bright future ahead of me in continuing inspiring others to see the infinite value of their own lives just as I have in mine. KRL: In your experience, what are the biggest misconceptions about mental illness? Emily: (1) I think one of the biggest misconceptions about mental illness is the perspective that medication is the only answer for treatment. Some think that those diagnosed with mental illness must be medication-compliant in order to recover and get better. I disagree. Why? Because I do not believe that medication is the cure-all. I believe that it takes time for individuals to reflect, process their emotions, learn how to articulately communicate how they feel, come out of denial, forgive others and themselves, and learn to embrace their strengths and weaknesses…I believe THAT is the healing process. (2) Another big misconception about mental illness is believing that all persons with mental illness are violent. That is hardly true. Those with mental illness are more likely to be victims of crime. (3) Too often, many think about mental health as a negative subject that concerns discussing what is wrong and abnormal about an individual with mental illness. However, I believe that mental health is also about what is RIGHT and talented about an individual! So another great misconception that many have is that there is no future for those who have mental illness. To receive a diagnosis is not a death sentence. Recovery and transformation is possible as long as the individual has the courage to transform their weaknesses into strengths. KRL: What can be done to correct those misconceptions? 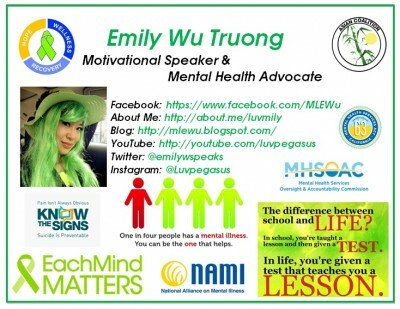 Emily: To debunk the misconceptions, it will take courage to confront a topic many are often afraid to talk about openly. Committed mental health advocates passionately striving to alleviate the stigma and discrimination on mental health and illness, will need to come together to conduct community outreach, engagement, and educational events. Then the topic of mental health and illness will not be such a stigmatized subject any more, and will become normalized in our communities. To normalize this subject, I hope in the near future that public education will implement mental health as a subject to educate everyone on this important topic for prevention and early intervention. KRL: What has been your involvement in the effort to educate the public? Emily: I am involved with various organizations, committees, and campaigns working to educate the community regarding mental health. 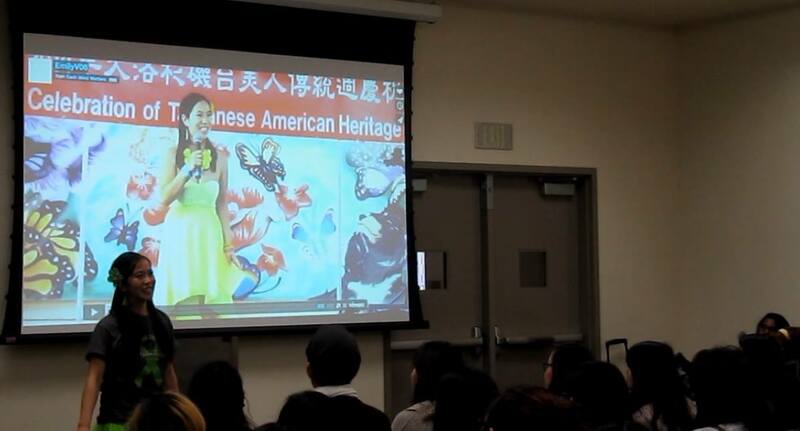 It first began in July 2013 at a Legislative Briefing on Asian-American Mental Health when I openly stated, “I will not end my life because I have a story to share. The more we talk about mental health, the more we will alleviate the stigma. There is no shame. There is no shame.” Since then, I have become a spokesperson for California’s Mental Health Movement, Each Mind Matters, a member of the Client and Family Leadership Committee of the Mental Health Services Oversight and Accountability Commission in Sacramento, and the newest board member of the NAMI (National Alliance on Mental Illness), San Gabriel Valley affiliate in LA County. [I am also] an honoree for Senator Ed Hernandez’s 2015 Woman of the Year Award. Much of my effort to alleviate the social stigma of mental health involves my presentations, civic engagement, social media, and my blog. KRL: On a more personal note, what prompted you to seek a diagnosis? Emily: Two summers ago, events began to trigger my mental breakdowns, and I was experiencing feelings of worthlessness. At work, I felt like my supervisors were looking down on me and were not appreciating my heartfelt efforts. Feeling judged and taken for granted, I broke down in tears and was so emotionally exhausted to the point I had no capacity to eat. I also experienced insomnia, the inability to fall asleep. One of my family members was very concerned about me, and I came to a point where I knew I needed help. KRL: After your diagnosis, were you ready to accept it? Emily: Acceptance of my diagnosis came quickly because I became sick and tired of being sick and tired, and I had come to a point in my life where I knew something needed to change. I knew I was suffering from low self-esteem for most of my life, and I knew I needed to find support, learn self-respect and self-compassion in order to help me help myself. KRL: What was the reaction of family and friends? Emily: Navigating stigma and dealing with discrimination has not been easy. Former friends were not able to accept that I was someone who needed therapy. I was called “the crazy lady,” and a picture of my face was placed at a school mentioning that I was not welcome there, but I chose to not allow their ignorant actions [to] affect or define me. Having been a mental health advocate and motivational speaker for almost three years now, I now have a larger network of friends and mental health advocates that I know locally, nationally, and internationally whom I can rely on for support. KRL: What are your techniques of self-care and coping skills to maintain your mental health? Emily: I’ve gone to group therapy and attend support groups. Recovery International, which uses cognitive behavioral techniques, has been one of the best places I’ve attended to learn to transform my thought patterns from insecure thoughts to secure ones. Other than that, I learn to see the good in the bad, and focus on the things I can do, instead of can’t do. I borrow self-help books from local libraries by Deepak Chopra, sing inspirational songs, dance, walk in the park, and play with my cat as cat therapy. KRL: What are your future plans? Emily: I plan to continue being a motivational speaker to debunk the public perceptions of mental health and mental illness. My future plans are to write my own book about my life, to continue inspiring others to let them know that they are NOT alone in their struggles, and that with help, there IS hope!